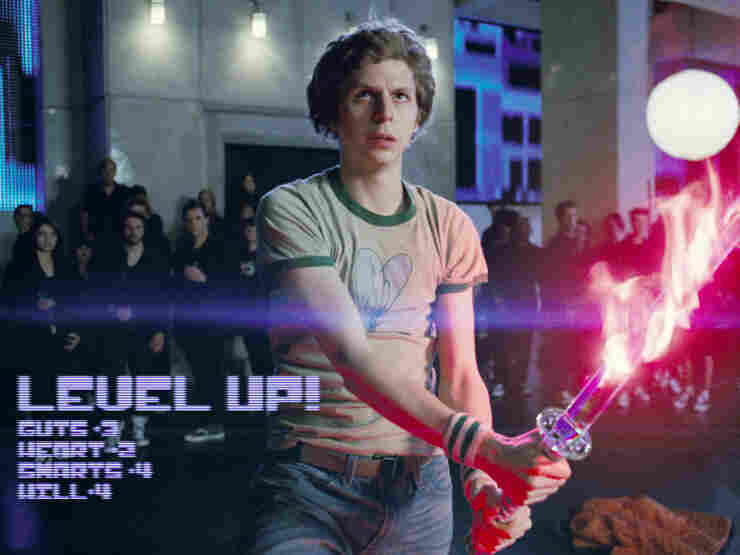 'Scott Pilgrim' Versus The Unfortunate Tendency To Review The Audience As Scott Pilgrim vs. The World rolls into theaters this weekend, you've got your good reviews, your bad reviews, and your reviews that aren't really about the movie at all -- they're about boys and gamers. Scott Pilgrim Vs. The World may be one of the most heavily previewed movies in years. Promo screenings, preview screenings, Comic-Con ... it feels at times like everyone who really cares about it has seen it by now -- and the reviews have been rolling in for quite some time. Full disclosure: I think it's great. I also think it's so heavily stylized that it's bound not to be everyone's favorite film. It's not aiming to be liked by all; it's aiming to be adored by many. If director Edgar Wright weren't okay with the film's being polarizing, he'd have backed off from some of its delightful little quirks. But I have to say to those reviewing it: what's completely unnecessary is being hostile and condescending about the target audience -- and I can say that, because I'm emphatically not part of it. The review in the St. Petersburg Times begins, "First of all, I'm not a video gamer. I have discovered more appealing ways to not have a life." The New York Observer sniffs that the film is "clearly directed at an audience with generational ADD." Here's one from Philadelphia Weekly: "Scott Pilgrim Vs. the World is Fan Service: The Movie, an insular, punishingly alienating experience preaching only to the faithful, devoted hearts of arrested 12-year-old boys. It’s singularly fixated on video games and shallow visions of women as one-dimensional objects to be either obtained or discarded and offers no possible point of entry to anybody over the age of 30." Let's start with "no possible point of entry to anybody over the age of 30." The very first image in this film -- the literally very first thing you see with your eyes and hear with your ears -- is the Universal logo, rendered as it would look and sound at around the time I was playing Pitfall! on my extremely sophisticated Atari system in 1983. This is literally the "point of entry" for the entire film, and on average, it's going to mean more to people over 30 than under. Moreover, this explanation -- and the other ones that aren't as explicit but basically make the same point, that it's a story for, about, and only even potentially satisfying to teen gamer comic-reading boy hipsters (am I leaving anything out?) -- defies all common sense as well as anecdotal evidence I can serve you right now. I am over 12. I am over 20. I am over 30. We will stop there. I am also, you might note, not a boy. I don't read comics and never have -- unless we're counting the cartoons in Highlights magazine that taught me that Goofus is bossy and Gallant loves to share. I am also, despite that history with Pitfall!, not a gamer. I own a Nintendo Wii, on which I enjoy boxing, tennis, being extremely bad at Super Mario Galaxy, and sometimes even playing Dancing With The Stars (deal with it), in which I have mastered the cha-cha at the professional level. If you are under the impression that this makes me a "gamer" anywhere except possibly in the sun-dappled rec rooms of some very rad retirement communities, you're off your nut. There's no reason to be angry at the people you imagine a movie will make happy just because you didn't like the movie. Listen: I hated Dinner For Schmucks. I hated it like it kicked my dog and sent me an invoice. But other people in the theater laughed, and every time I have told anyone how much I hated it, I have said, "But please note: other people in the theater were laughing, so maybe it's me." I don't know who those laughers are. I don't know how they are different from me in age, gender, recreational activity preferences, or general opinions on the matter of whether Steve Carell should wear prosthetic teeth. I don't know. They laughed; I didn't. And if I'd found myself writing, "Carell's performance is irritating partly because of the know-nothing goobers who were laughing the whole time," I hope I would have paused before hitting "publish" and thought, "Perhaps this is not the most helpful thing I could say about this movie." Hating Scott Pilgrim vs. The World is perfectly fine. It's got a style; you sort of embrace it and dig it or you don't. But when there's too much effort given to tut-tutting the people you imagine to be enjoying it, or declaring and promising that only narrow categories of losers and non-life-havers and other stupid annoying hipsters could possibly be having a good time when you're not, it sounds pinched and ungenerous. And, not to put too fine a point on it, a little bit jealous and fearful of obsolescence. Here's what I'm saying: I'm a woman, I'm in my late thirties, I can't handle first-person shooters, I'm afraid of Comic-Con, and I really, really liked Scott Pilgrim vs. The World. I hope I'm not, you know, blowing your mind.